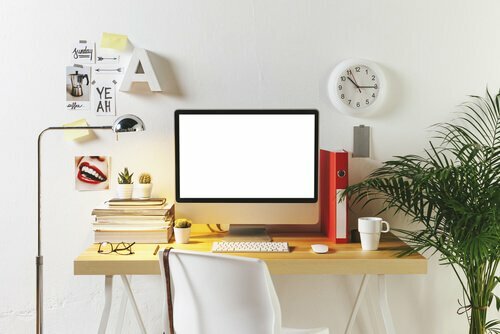 A Time To Shop | Organize Your Desk DIY Style! When you’re caught in the hustle and bustle of working, it’s easy to let your work space get a little out of hand, perhaps to the point keeping it organized is a job within itself! If this sounds like something you have experienced in the past or are experiencing at the moment, the path to organization can be easy. Take a look at these tips we’ve compiled on how to organize your desk in creative, smart ways! What you’ll find here should appeal to your inner artist and your outer organizational needs! Create your own station for charging your mobile devices. While the advent of the smartphone and similar devices has brought multiple conveniences to our lives, they’ve brought with them the massive displeasure of knotted or cluttered charger cords. You can solve this with a simple shoebox, design tools and scissors. Decorate your box, cut as many holes as you need, tuck a power strip inside, and you’re set! Add a painterly touch to your storage. You can create customized storage containers with wooden boxes, acrylic paint and some painter’s tape to help keep things neat. The end result will be personalized to your tastes and your office decor. Create magnetized holders for your smaller office supplies. You can buy a box specially made for crafting and adhere magnets inside. Your paperclips and other small objects stick there until you need them. You can even decorate the box with paint if you’d like! You can do the same thing with pencil holders, creating a useful and pretty place to keep all those vagrant pencils and pens. Recycle your unwanted or worn belts into a useful storage space. You can do this by attaching them to a wooden board (already decorated, if you wish) with a hammer. You can then keep notes, photographs and other loose papers there with your belts as an adorable hanger. Make your pin board more visually interesting. You can cut your corkboard into shapes and, with some paint, have an aesthetically pleasing place to keep all of your small notes. Jazz up your magazine storage. Some acrylic paint and your imagination are all it takes to make your old magazine containers prettier. Glamorize your desk containers. All you have to do is buy glass bowls from your home decoration store of choice. Use metallic gold spray paint, aluminum foil and painter’s tape to make your miscellaneous storage look elegant and gorgeous. Create pencil and pen storage with cork. This project actually has more than one use. You will be able to both keep your writing tools in this handy storage spot, but also attach notes for your household to its surface. Making it is simple. Buy six large coasters made from cork, glue them to each other and create holes in them that are two-thirds of the way through the cork. Click here to read more at A Time to Shop.